For the arena in Dallas, Texas, see American Airlines Center. The American Airlines Arena is a sports and entertainment arena located in Downtown Miami, Florida along Biscayne Bay. It was constructed beginning in 1998 as a replacement for the Miami Arena and designed by the architecture firms Arquitectonica and 360 Architecture. The Arena is home to the Miami Heat of the National Basketball Association. The American Airlines Arena is directly served by the Miami Metrorail at Government Center station via free transfers to Metromover Omni Loop, providing direct service to Freedom Tower and Park West stations. The Arena is also within walking distance from the Historic Overtown/Lyric Theatre Metrorail station. The American Airlines Arena has 2,105 club seats, 80 luxury suites, and 76 private boxes. 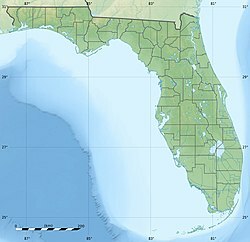 The Waterfront Theater is Florida's largest theater which is housed within the arena, that can seat between 3,000 and 5,800. The theater can be configured for concerts, family events, musical theatre and other stage shows. American Airlines which has a hub at Miami International Airport maintains the American Airlines Arena Travel Center at the venue. The airline also holds the naming rights for another NBA venue, the American Airlines Center for the Dallas Mavericks and the Dallas Stars, which opened in 2001. 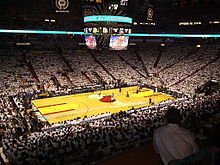 The American Airlines Arena opened on December 31, 1999 and its construction cost was $213 million. Architectural design team members included George Heinlein, Cristian Petschen, Reinaldo Borges, and Lance Simon. The American Airlines Arena was inaugurated with a concert by Gloria Estefan. Two days later, on January 2, 2000, the Miami Heat played its first game in the new arena by defeating the Orlando Magic 111–103. As part of its sponsorship arrangement, American Airlines had a giant aircraft painted atop the arena's roof, with an American Airlines logo in the center. The design is visible from airplanes taking off and landing at Miami International Airport, where American has a hub. The arena also has luxury skyboxes called "Flagship Lounges", a trademark originally used for American's premium-class lounges at certain airports. Local sportscasters often refer to the arena as the "triple-A". Some sports reporters on the local news stations such as WSVN have referred to the arena as "A3" (A cubed). The arena is known for its unusual scoreboard, designed by Artist Christopher Janney. Drawing on the underwater anemone forms, the scoreboard also changes colors depending on the atmosphere. For concerts in an arena configuration, end stage capacity is 12,202 for 180° shows, 15,402 for 270° shows, 18,309 for 360° shows. For center stage concerts the arena can seat 19,146. The Miami Heat has not had to pay to use the $357-million venue, which sits on $38 million of county land; the county has paid $64 million in operating subsidies. "It was never a good deal," says former Miami-Dade Commissioner Katy Sorenson, who opposed the new arena in 1996. "There are certain politicians who just get stars in their eyes and don't really think about what the real cost is going to be." WTVJ, the city's NBC owned-and-operated station in Miami, had their Downtown Miami Studios in the back of the arena from 2001 till 2011. Despite American Airlines' logo change, American Airlines Arena still uses the airline's old logo. The arena as seen from Freedom Tower station. Traffic congestion after events can cause delays for those who choose to drive to the arena. Visitors to the American Airlines Arena are encouraged to take Metrorail, Metromover, or Metrobus, as parking can be scarce and expensive. Metromover's Freedom Tower station is located two blocks west of the arena. The nearest Metrorail stations are Government Center and Historic Overtown. The Metromover is free to ride and connects to Metrorail at Government Center station. American Airlines Arena features 939 parking spaces during HEAT Games. On-site parking is reserved for Premium seat and Dewar's 12 Clubhouse ticket holders. On-site parking spaces must be pre-purchased through the Arena's Official Parking Provider, ParkJockey. The American Airlines Arena along with the American Airlines Center in Dallas, hosted the 2006 NBA Finals and the 2011 NBA Finals. The Miami Heat played the Dallas Mavericks. The Heat won the championship in 2006 in Dallas and the Mavericks won in the 2011 rematch in Miami. These series were the first and second appearances in the NBA Finals for both franchises. As the airline held the naming rights to both venues, people nicknamed the matchups as the "American Airlines series". The arena hosted the 2012, 2013 and 2014 NBA Finals along with the Chesapeake Energy Arena in Oklahoma City in 2012, and the AT&T Center in San Antonio in 2013 and 2014. In 2012, the Heat defeated the Oklahoma City Thunder in five games, winning the championship at home. In 2013, the Heat played the San Antonio Spurs. The Heat faced a 3-2 series deficit returning to Miami but won games 6 and 7 to defend their championship. In 2014, the Spurs defeated the Heat in five games in San Antonio and won the championship and the rematch. Since 2015, the arena has hosted the annual Hoophall Miami Invitational, a National Collegiate Athletic Association Division I college basketball showcase event. The American Airlines Arena also hosted the first UFC event in the state of Florida, UFC 42: Sudden Impact, on April 25, 2003. The arena also held the WCW pay per view Uncensored (2000) in March 2000. The NFL Honors is scheduled for American Airlines Arena in 2020. Shakira has performed 9 sold out shows in American Airlines Arena, the most number of appearances at the venue among all the artists. She also holds the record of having most shows in the venue within one single tour, Oral Fixation Tour in 2006, with 5 sold out shows. Mariah Carey performed here as part of her Rainbow World Tour on March 29, 2000. On November 7–8, 2002, Cher's Living Proof: The Farewell Tour performed at American Airlines Arena for an NBC special, which aired in April 2003, winning an Emmy Award. On March 28, 2004, Britney Spears performed to a sold out show as part of The Onyx Hotel Tour. The show was broadcast live over the world. She performed as part of her The Circus Starring Britney Spears Tour at the arena on March 7, 2009 and set an attendance record with a sold-out crowd of 18,644, beating out Celine Dion who previously gathered a 17,725 crowd. It is noted as the largest concert attendance in the arena's history as of 2009[update]. The arena was the setting for the highly publicized MTV Video Music Awards, both in 2004 and 2005. Both events brought millions of dollars into the Miami-Dade County economy. U2 brought their award-winning Vertigo Tour to Miami on November 13 and 14, 2005. Shakira performed in the arena as part of her Tour of the Mongoose for the first time on December 2, 2002. 4 years later, she performed in the arena on September 15 and 16, 2006 as part of her Oral Fixation Tour and returned for 3 more shows (December 7, 8 & 9, 2006), where the DVD footage of the concert was filmed. With 5 shows together, this makes the Colombian singer obtaining the most sold-out shows in the arena as a female artist. She brought her The Sun Comes Out World Tour to the arena again on September 27, 2010. 7 years later, she returned to the arena with El Dorado World Tour on August 17 and 18, 2018. On December 4–5, 2007, the Argentine rock band Soda Stereo performed at the American Airlines Arena as part of his farewell tour Me Verás Volver, being this tour a sellout in Argentina and the Americas. It was six (6) sold out shows in the famous Estadio Monumental Antonio Vespucio Liberti. The arena was host to For Darfur benefit concert, which was the Miami stop for Kanye West's Glow in the Dark Tour, on May 6, 2008. Tina Turner performed her Tina! : 50th Anniversary Tour at the arena on October 30, 2008. Celine Dion performed her Taking Chances Tour at the arena on January 23, 2009 and set an attendance record making it the largest crowd in the arena's history. The cast of Mexican hit TV series Two Faces of Love beat out Britney Spears selling out a crowd of 18,693 making this the largest concert attendance in the arena's history, as of 2010[update]. Lady Gaga performed here for The Monster Ball Tour to a sold-out crowd of 14,695 on April 13, 2011 and was scheduled return as part of her Born This Way Ball Tour on March 16, 2013, but cancelled, not only this show but the entire rest of the tour, due to a hip injury. Jennifer Lopez performed at the arena on August 31 and September 1, 2012 to two sold-out crowds as part of her Dance Again World Tour alongside with the help of Enrique Iglesias. Madonna performed at the arena on November 19–20, 2012 as part of her MDNA Tour. The sold out shows were filmed for a DVD, entitled MDNA World Tour. Miley Cyrus performed a total of three sold-out concerts in the arena, as a part of her Best of Both Worlds Tour on January 31, 2008, Wonder World Tour on December 2, 2009 and Bangerz Tour on March 22, 2014. Kanye West performed here during his Saint Pablo Tour on September 16–17, 2016. Australian worship band Hillsong United recorded a 2-hour long live CD/DVD set, entitled Hillsong United: Live in Miami, which was released in August 2011, which was filmed, recorded and played at the arena in front of a sold out audience. One Direction performed a sold-out show at the arena on June 14, 2013 as part of their Take Me Home Tour. Indoor electronic dance music event Sensation took place at the arena on October 11–12, 2013. Katy Perry performed a sold-out show at the arena as part of The Prismatic World Tour on July 3, 2014. She returned to the arena as part of her Witness: The Tour on December 20, 2017. Demi Lovato performed a show at the arena as part of her Demi World Tour on September 14, 2014. Ariana Grande performed a show at the arena as part of The Honeymoon Tour on March 28, 2015. She also performed at the arena for the Dangerous Woman Tour on April 14, 2017. Chris Brown performed for a sold-out crowd at the arena during his One Hell Of a Nite Tour on September 3, 2015. Janet Jackson performed a show at the arena as part of Unbreakable World Tour on September 20, 2015. She will perform again on August 5, 2018, as part of her State of the World Tour. The Weeknd performed a show at the arena as part of The Madness Fall Tour on December 19, 2015. Rihanna performed a show at the arena on March 15, 2016 as a part of her Anti World Tour. Selena Gomez performed at the arena as part of her Revival Tour on June 11, 2016. Adele performed two sold-out concerts at the arena as part of her Adele Live 2016 tour on October 25–26, 2016. Demi Lovato performed a sold-out show at the arena as part of her Tell Me You Love Me World Tour on March 30, 2018. 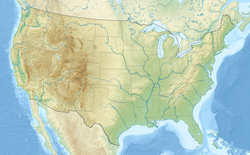 Wikimedia Commons has media related to AmericanAirlines Arena. ^ "Westchester Reform Temple, Rogers Marvel Architects". www.architecturalrecord.com. ^ "Facchina Group of Companies, LLC — Facchina Construction Company". Archived from the original on 2012-04-02. Retrieved 2011-09-10. 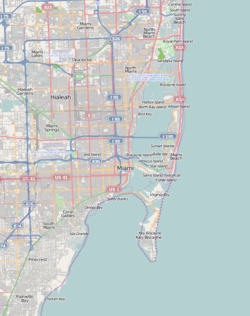 ^ "Miami And Coral Gables, FL Travel Center Archived 2009-04-06 at the Wayback Machine." American Airlines. Retrieved on April 9, 2009. ^ "ESPN.com: SPORTSBUSINESS - Stadium naming rights". www.espn.com. Retrieved 2019-04-14. ^ "The HEAT Group Teams Up With New Parking App, ParkJockey". Miami Heat. ^ Sentenac, Hannah (2014-10-30). "Avoid Parking Hell at Miami Heat Games With ParkJockey App". Retrieved 2016-07-25. ^ Lindner, Emily (March 28, 2015). "Justin Bieber Joined Ariana Grande Onstage And She Rapped Big Sean's Part On 'As Long As You Love Me'". MTV. Viacom. Retrieved March 29, 2015. ^ Sonawane, Vishakha (March 16, 2016). "Rihanna Performs Raunchy Moves With Drake At 'Anti' Tour Amid Dating Rumors". International Business Times. Retrieved March 16, 2016. ^ Chatterjee, Kika (June 11, 2016). "Twenty One Pilots, more dedicate songs to Christina Grimmie's memory—watch". Alternative Press. Retrieved June 13, 2016. ^ Crandell, Ben (2016-10-25). "Review: Adele dazzles Miami crowd, Hillary Clinton". Retrieved 2016-10-26.